Interior Ceilings and Walls, LLC is a distributor of finished interior building products serving much of New England from our offices in Brockton, Massachusetts. 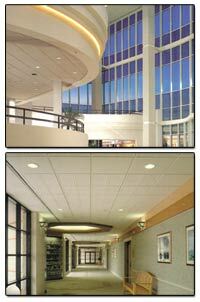 Interior Ceilings and Walls, LLC can provide ceiling and wall systems to fit any application. Acoustical ceiling products have undergone many changes and recent advancements. Our sales staff provides more than twenty years of expertise and knowledge in the acoustical field. Interior Ceilings and Walls, LLC carries many in-stock items, including suspended grid and lay-in acoustical panels or tiles. This provides our customers with minimal waiting time between orders and delivery to job sites. Specialty items may be ordered to your specifications. Interior Ceilings and Walls, LLC promises its customers superior service at competitive prices. Our knowledgeable team can help you with the latest in acoustical ceiling products, metal pan and linear metal ceilings, and our large in-stock inventory of first class wall systems, doors and frames, lighting products, insulation and more. Our continued return customer base can attest to Interior Ceilings & Walls' high level of dependability, competence and excellent service. Learn more about our interior wall, ceiling, and lighting products on our website, or visit a manufacturer's website by clicking one of the logo images below.